When Was the Last Time You Watched a Sunset? Rach Dobson, Life doesn't happen to you, you happen to it! As the sun sank slowly behind the rocky range, the sky turned into a painting streaked with flecks of pinks, golds, reds and oranges. I was the only person on the flat, thin, rocky summit of Bluff Knoll and all was silent except for the sound of the wind traversing up on over the thin ridge line of the Stirling Ranges. For a fleeting moment the sky was a magical kaleidoscope of sunny colours. The silence, the summit solitude and the colours in the sky made me feel alive and happy. One of those glorious outdoor moments. The hike down from Bluff Knoll would be in the dark and probably a little cooler and windier but the discomfort was so worth the experience of enjoying this tiny slice of beauty. As far back as I can remember, sunsets have always been a joy for me. It is when Mother Nature is at her most beautiful and artistic best. My most vivid memories of sunsets have been when I have been travelling or working as an outdoor guide. When I travel, I will always make an effort to enjoy a sunset which can often be hit and miss but part of the adventure and I feel that allows the opportunity to see a place at its best. Outdoor guiding afforded me the luxury of enjoying sunsets outdoors on many occasions. There is something infinitely beautiful and perfect about being able to take in a sunset from a remote campsite. Either way, as someone who loves colour, sunsets have enabled me to appreciate nature offering a daily painting of the sky to the world for free allowing us to lose ourselves in the moment just for a minute in time. I believe sometimes its the way where we reserve a spot on holidays etc. to make time for sunset viewing. 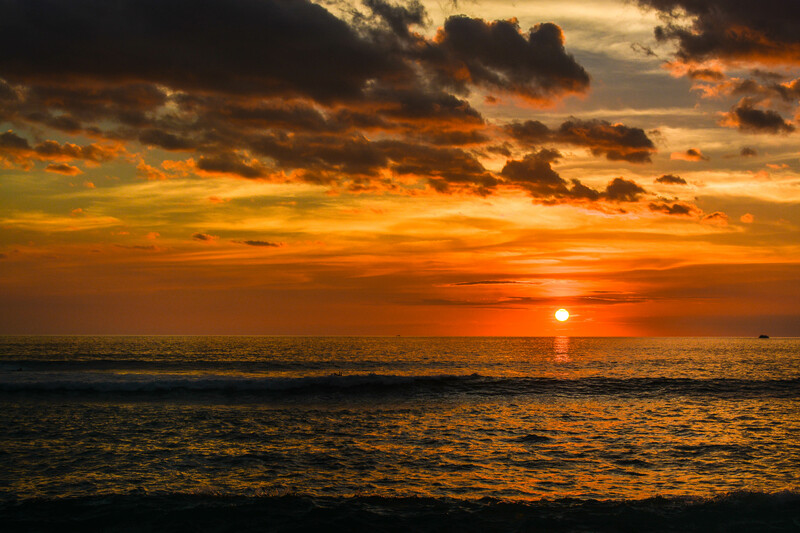 Sunsets are not just for the outdoor lovers, evening surfers and photographers – they are there for everyone. I am lucky to be able to live in a spot where sunsets will almost force their way in through your windows and that, is why they have become a daily ritual almost for me. On reflection, when watching a sunset, there is a stillness, peace, focus, quiet, and beauty that is often missing in or lacking in the rush of everyday living. Sunsets allow us the opportunity to slow down and appreciate beauty, sign off at end the day on a positive note, get outside, breathe in some fresh air, enjoy some of nature’s finest gifts and maybe, just maybe feel a little inspiration about the good things in life. Just recently, I was sitting out on the rocks at Ocean Beach lookout watching the last rays of sun across the southern ocean and some seals were playing below me near a band of granite ocean boulders catching fish and lolling in the waves and a couple of curious whales who had been hanging he bay swam across to check out the scene. For a moment in time it was me, some seals, some whales and a sky streaked with gold. These are the moments that remind me of the perfection in life. So, when and where was the last time you stopped and watched a sunset? Travel and the outdoors has always being a main staple in my life. It's the mix of the anticipation, the excitement, the growth, the happiness and the peace that I love when I am outside and on the road. Life has been an endless journey of exploration, experience and wonder that has allowed me to travel through some of the most beautiful outdoor spots in the world - an individual bias I know, but it has been a damn fine ride so far! My former lives have included outdoor guiding, expedition medic, wilderness first aid instructor, leadership facilitator, project manager, instructional designer, learning and development geek and adventure travel company owner. Right now I am pursuing my passion in travel writing and photography and trying not to stress too much about breaking into the writing industry and earning a living. At the moment life revolves around taking in summer sunsets with my favourite human, weekend surfing adventures, getting the surf gear sorted for upcoming explorations to Hawaii, Indonesia, Philipines and Gold Coast to surf left handers, drink spiced rum, delight in coffee, explore the local spots, snap photos and capture the experience here in my blog. In and amongst that I am finishing off my writing studies, looking for a pet dog to enjoy my outdoor adventures with and generally just finding the time to be around people I love and enjoy and to be continually excited to learn and enjoy life. Opportunities are supposed to be snapped up not left to blow away so may your bags be always half packed, your passport ready and your heart a little bit here and a little bit on the road; and may my stories bring you love and joy! African Britishness – So if it was that good in your country what are you doing here?